Deep under the tropical ocean in between the reefs, many triggerfishes can be found. They inhabit the deep ocean of the Indo-Pacific. Normally recognized for their brightly color features with lines and spots. They are small in size almost from 20-50 centimeters but they are some almost as big as 1 meter in length. 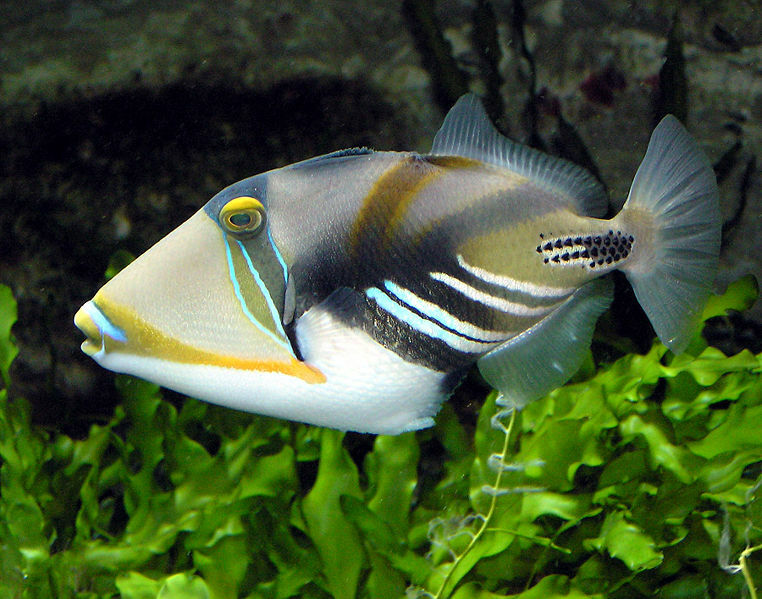 Triggerfish can be found in exhibition marina life aquariums, they are known to have bad-tempers. 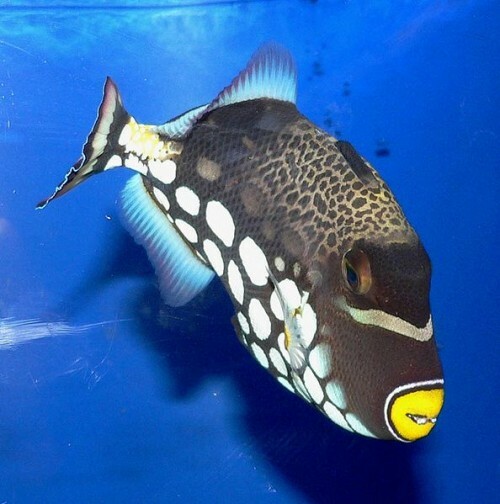 They are almost 40 different species of triggerfish altogether that exist in the world and all species looks alike with an oval shaped compressed body. Their most significant feature is their set of strong teeth protruding out of their mouth that are used to crush shells. Their heads are oversized in which shows off its sets of teeth. Triggerfish’s fins are unique in both shape and purpose. Its dorsal fins provide slow speed movements because of its capabilities to undulate from side to side. Its caudal fin is shaped like a sickle that enables it to escape from predators. Two pelvic fins are fused together to form a single spine for every triggerfish. Their scale are covered by a rough skin which forms a tough armor and in total a normal adult triggerfish has a total of 10 sets of teeth. Research has proved that triggerfish has a notorious personality and aggressive behavior especially when they are protecting their eggs. Many misunderstood the triggerfish because of their slow swimming behavior and their diet. They normally consume planktons, mollusks and sea urchins. They are not only threatening to underwater intruders but also to human as well. Their strong teeth can cause bruises especially when it is angry. They are also known for its outstanding intelligence in which they are capable to learn from their mistakes. Triggerfish lay their eggs in a hole they make at the bottom of the sea. They are very protective of their nest and are constantly seen swimming around the area ready to strike any creatures that trespasses. Even for human that seems to be swimming near would get attack as well. It is best when swimming near triggerfish’s nest to swim away before swimming back upwards to the surface. Triggerfish has many species and only a few are allowed to be consumed. Certain species especially triggerfish in giant sizes should be avoided because it is known to maybe ciguatera, a common foodborne illness in fishes because of their consumption on reef fishes that might be contaminated with toxin. Many love to go fishing for Triggerfish because of their naturally bright and unique color and features. Triggerfish are known to be bait-stealers in which they will bite off bits of the bait until there are nothing left on the hook. When fishing for Triggerfish, it is best to use a tough strip of fish flesh or squid mantles. They can also be found in any marine aquariums. However, since the global warming occurred the population of Triggerfish has been affected because these fishes lives in coral reefs and today a lot of coral reef are slowly dying because of the bright sunlight and the rising temperature.